← GEARING UP — BLUEBIRD NESTING SEASON FOR 2014. 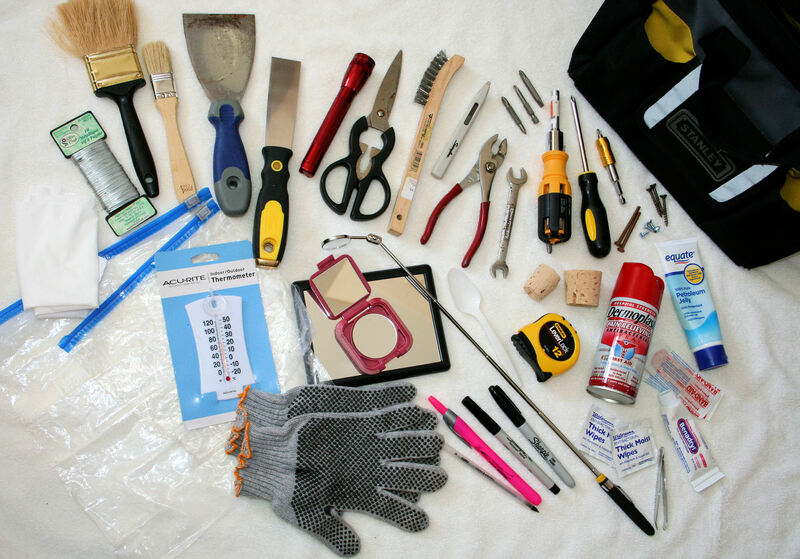 BLUEBIRD TRAIL MONITORING — TOOLS OF THE TRAIL! WHAT’S IN MY TRAIL BAG? Check out all the nifty tools and “stuff” that helps me on the trail. Can you guess what everything is for? This is pretty typical of my 1-2 x a week monitoring tools I take to each nestbox. FYI, if you have a backyard nestbox, this won’t be necessary. When I check my bluebird trail, I need everything handy in one place to save me time and effort. I am posting this picture (above) to show you what’s inside my bluebird trail tool / tack bag — current from 2013 and for what I’ll use for 2014. You can look at my contents, and I’ll repost in two weeks with the full list and what I use everything for. HINT: This does NOT include what I keep in the back of my car, which is reflected in the picture below. My trail bag is shown in the second picture–it is yellow and black and made by Stanley (top left of second photo). I can tell you I use all items within one nesting season — March through August. It is hard to believe all this can fit in a small bag, but it does. If it helps you understand, it has taken several years to tweak what I need and what I don’t need. This might be more than some would use–perhaps not enough for others. This will vary on your own nesting boxes you monitor and how many and the problems you have to deal with. Best to start small and add on as you get experienced. What might be fun for you experienced monitors: add your thoughts to this blog before I come back in two weeks. What is missing here that you use often on monitoring your bluebird trails and why do you need that item? Have fun with this. I hope I spark some questions on this post! See you in two weeks. I will post the list of items and what I use them for. See you soon! Today is February 25th (2014) and I’ll be back on March 11th! I have a rolling workshop! 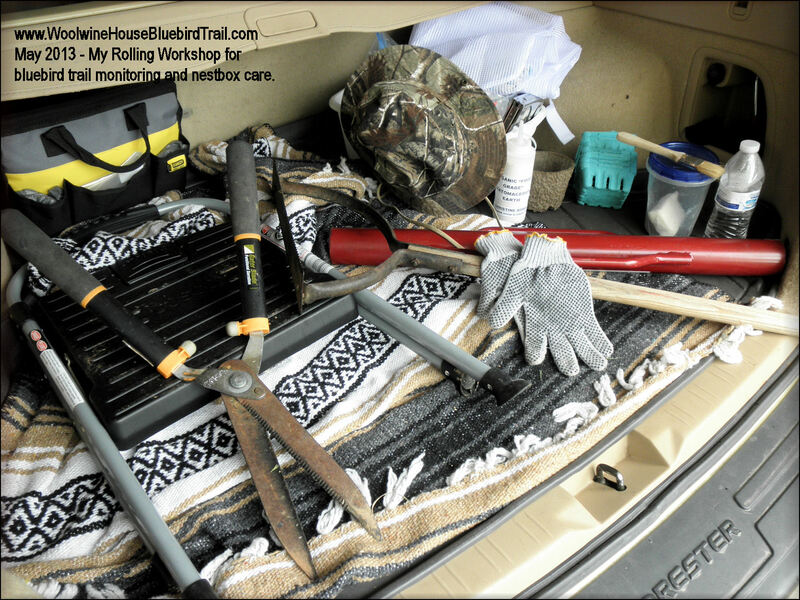 This is the back of my car–the things I don’t carry in my trail bag but have handy on the trail, if needed.